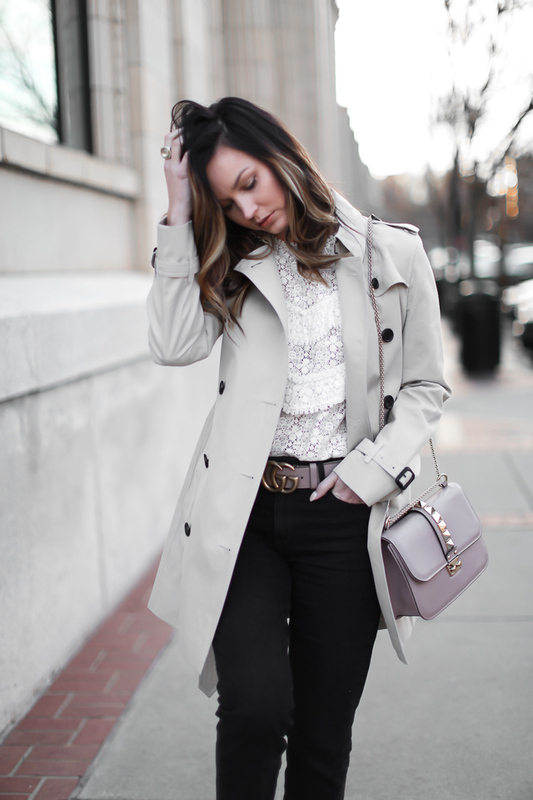 When it comes to classic, investment pieces for my closet, I always opt for neutral + feminine. I've had this trench for a couple of years now and it never lets me down. A good trench is perfect for layering, or even being the statement piece of your outfit. 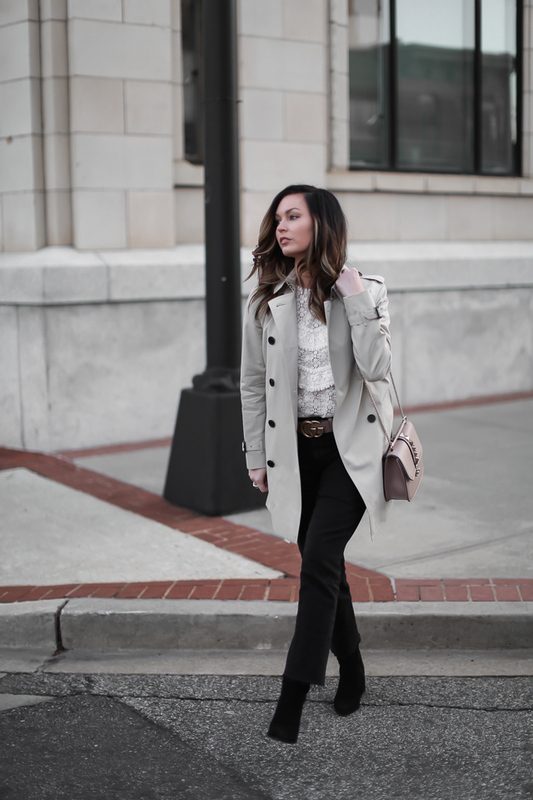 Even if you're in black from head-to-toe, a neutral trench can totally make your outfit. Also, I'm obsessed with these Paige jeans right now! The flare at the bottom isn't too much and the fit is absolutely perfect. So comfortable + chic! I hope you all had a great weekend! My best friend came into town on Thursday and her little brother's wedding (aka, my little brother) was on Saturday night. Between the rehearsal, brunch, decorating their wedding night suite, and the wedding, we had such a busy, but beautiful weekend surrounded by our family + friends. I took a few days off from social media, put my phone away for the most part, and was present for each and every moment and it felt so great. Totally necessary sometimes! Oh and I can't forget - the chickens!! My best friend brought them on Thursday from Charleston and they are so cute. We're already so in love with them! Love this look so much! That Valentino bag is so cute but still very chic and edgy!! 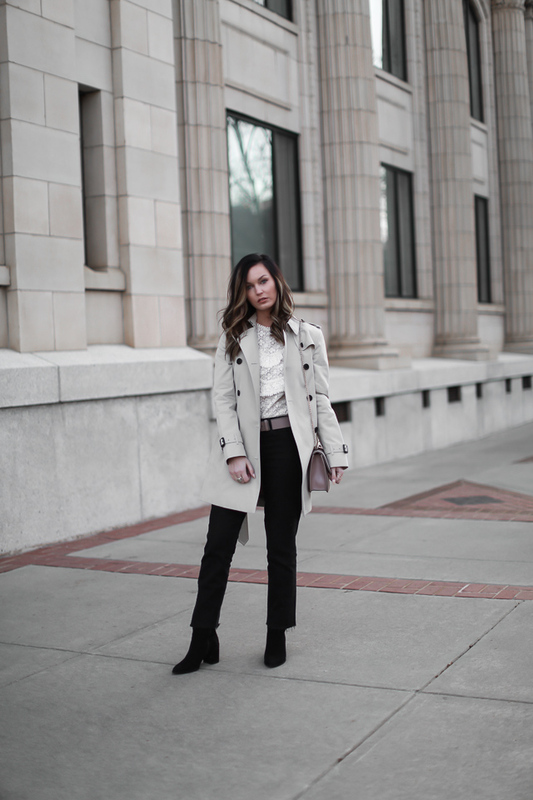 A trench coat is the one staple that's missing from my closet. I definitely need to add one soon!